Anyone who reads the news is likely to have seen the recent paper in Circulation evaluating a new biomarker of acute coronary syndromes: cardiac myosin binding protein C (cMyC) . This paper has been covered by the BBC, the Telegraph and the Daily Mail among others. The Daily Mail has hailed cMyC as a new ’15 minute test for heart attacks’ that’s ‘twice as accurate as existing tests’. That could be groundbreaking. Like cardiac troponin, cMyC is a protein contained within the contractile apparatus of cardiac myocytes. Skeletal muscle also has MyC, but not the cardiac isoform – hence the small ‘c’ in ‘cMyC’ (which stands for ‘cardiac’). This cardiac isoform (cMyC) is highly cardiac specific and is abundantly expressed in myocytes. There are some experimental data to suggest that levels of cMyC rise earlier after the onset of acute myocardial infarction (AMI) than cardiac troponin. The big challenge for cMyC has been that there was no sensitive assay available. The team at Kings College, London, led by Mike Marber, appear to have approached Merck about this. Merck now runs the Erenna platform, which is a research analyzer. It was originally developed by Singulex, which now manufactures the highly sensitive troponin assay that uses single molecule counting technology. We’ve recently discussed that at St Emlyn’s. That troponin assay runs on an analyzer we could potentially use in practice (although it’s still not fast enough for use in the ED). The Erenna is a research analyzer, which requires a lot of manual input and couldn’t be used in an ED setting. However, it uses the same single molecule counting technology as the Singulex troponin assay. So that should make for a very sensitive test for cMyC. What is the new study? In the study that’s generated the recent news coverage, the group from Kings College, London has collaborated with Christian Mueller’s team in Basel. The team in Basel runs a huge ongoing study called APACE, which includes patients with suspected acute coronary syndromes within 12 hours of symptom onset. The team does serial sampling over 6 hours, although it’s not totally clear how many patients actually underwent sampling at 6 hours. The authors don’t tell us how many patients were discharged before they had their 3 and 6 hour samples. Patients were then followed up after 3 months, 12 months, 24 months and 36 months – by telephone or letter. I just want to emphasise that point for a moment. It’s really incredible that they manage to do this! APACE has been running for years. I’m not sure how the keep their team motivated to recruit and follow up patients, and how they manage to keep on top of all those follow up visits. So, I’m taking my hat off to the team in Basel! Using the data, they ran cMyC in frozen samples and worked out its diagnostic accuracy for the primary outcome of AMI, which was adjudicated. The results are actually really interesting. cMyC was as good as high sensitivity troponin T and I, and slightly better than a contemporary troponin assay, for diagnosing AMI. Using the limit of detection cutoff for troponin [Ed – if you want a quick update on what that means, follow this link] had almost perfect sensitivity and negative predictive value. But … cMyC had almost perfect sensitivity and negative predictive value (for AMI) too. And the specificity was higher. It would have ‘ruled out’ AMI in 32% of patients, while the limit of detection strategies would have ruled out 25% and 15% of patients with hs-cTnT and hs-cTnI respectively. cMyC could also rule another group of patients in, with 71.5% positive predictive value. What’s really impressive is that cMyC did this without being combined with troponin. 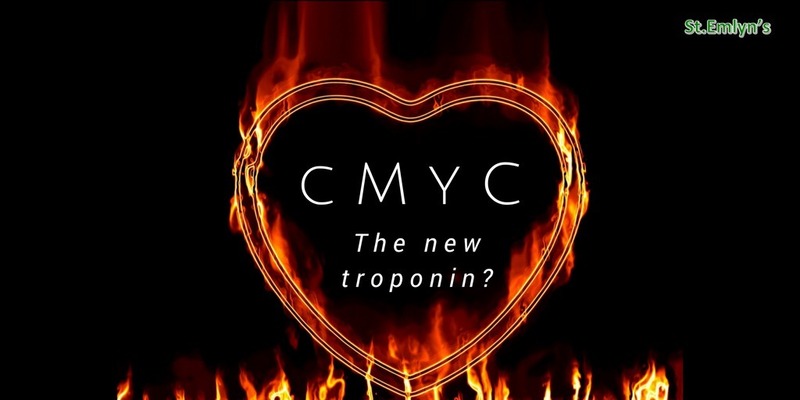 What this means is potentially groundbreaking: maybe cMyC is essentially a troponin alternative! It might be more sensitive soon after AMI, and it might be even better when troponin and cMyC are combined (there aren’t a lot of data presented on that). No, these findings are very promising but it will be a while before we see this in practice. The cutoffs used in this study were optimised to the dataset. The dataset was split into two – derivation and validation – but we still really need external validation (rather the internal validation, which is what they’ve done) before we get too excited. We also need an assay that we can use in practice – and it has to be reasonably priced. We could do without having to buy a whole new analyzer to run this test, because that can be extremely expensive – to buy the analyzer, train the staff and maintain it. While the authors give us some data on prognosis (survival), we could also do with some data on major adverse cardiac events. In this study, we only really saw data for a diagnosis of AMI and survival at 3 years. Lastly, we need to know if cMyC has benefits over other strategies. T-MACS, for example, can rule out over 40% of patients with a single blood test. Will there be benefits of running the additional assay over and above what we can achieve with troponin alone and modern risk scores? We’ve got some really promising data on other biomarkers like H-FABP and copeptin, but the challenge is to show the tangible benefit for patients over and above what we can achieve with troponin assays. So, in summary, this is really great work. It’s not quite the 15 minute wonder test that the Daily Mail has suggested, but it does have a lot of promise. We’ll look forward to seeing how this progresses, and wish Mike Marber and his team at Kings all the best of luck with their future work. Next: Next post: Who gets a Tetanus? You get a Tetanus!